The woman depicted is named, like the image, by her work: “the fruit seller.” The fruit seller stands in the foreground, leaning against the pole of a stand, her breasts exposed and her head lowered. She is surround by lush, ripe fruit: a string of bananas hangs on the right side of the image, and on the left a basket of pineapples and coconuts rests on the ground. A temple and a large banyan tree occupy the background. The Indian Fruit Seller was an original sketch done by William Daniell, inspired by his travels in India. 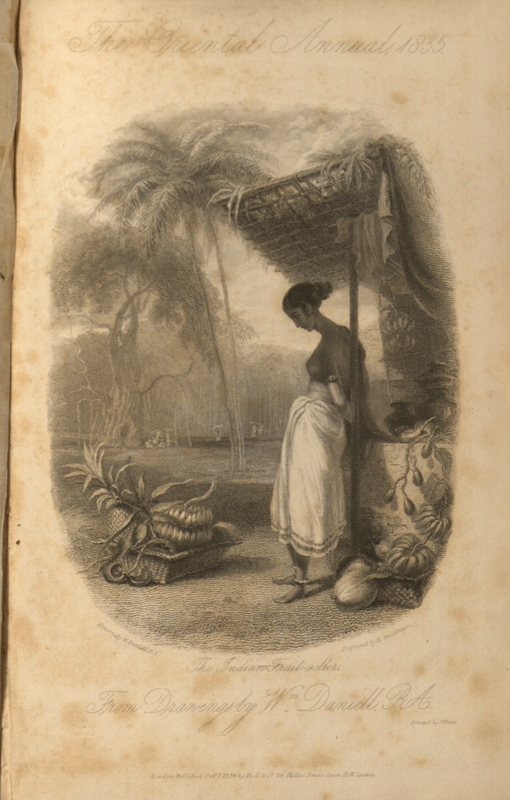 It is bound in The Oriental Annual, or Scenes in India (1835) as the frontispiece to the book. At the age of fourteen, William Daniell accompanied his uncle Thomas Daniell, a landscape painter trained at the Royal Academy, on a journey to India from 1786 to 1794. The first two years were spent in Calcutta preparing Views of Calcutta. After the first two years they traveled to the Punjab Hills and then back to Calcutta in 1971. They began a second tour in 1792, working their way through Mysore and Madras. After staying in Madras from 1793 to 1794 they finally returned to England. Drawings made during these trips were engraved in books and prints (some of which were exhibited at the Royal Academy). The Daniells arrived in India during a period of political transition, just after the departure of Warren Hastings and prior to the instatement of Charles Cornwallis (1738-1805), the new Governor-General of India. Cornwallis was the first Governor-General appointed under the new India Act of 1784 (passed during William Pitt's term as British prime minister). The act was passed in part as a means of reigning in the Hastings style of government, which was seen as “too indigenous, free-wheeling and popular, too benevolent and multi-national and not British enough” (De Almeida 168). Hastings became known for incorporating native Indians as administrators, financers, and civil servants. The India Act proceeded to centralize Company administration: a six-member Board of Control was created which controlled the Company’s possessions abroad, and the Governor-Generalship was made a Crown appointment with full control over other governors and presidencies in India. Additionally, the act created a centralized British military in India. Charles Cornwallis (1738-1805) gained experience in the military while serving in America, and was employed to carry out England’s imperialist vision in India. His strategic military victories on land (for example, in Mysore with Tipu Sultan) not only extended England's rule, but also provided sepoys that could be recruited and kept on reserve for the Napoleonic Wars. Additionally, Cornwallis’ belief that “every native of Hindoostan is corrupt” gave way to a purging of Indian natives from administrative positions and forbid mixing or socializing between races. A purification and segregation process, in which hybridity was especially scorned, took place under Cornwallis’s rule (De Almeida 168). Dalrymple claims that “these new racial attitudes affected all aspects of relations between the British and Indians” (Dalrymple 41). Prior to Cornwallis’s strict racial segregation, many British officials were integrated into Indian society by learning the language, adopting Indian dress and mannerisms, and marrying Indian women (bibis). The decline of this integration became apparent with the declining rates of bibis on wills; by the mid-nineteenth century no records of bibis on wills exist (Dalrymple 1). Even though these changes brought about tension between the British and Indians, many British officials continued to be patrons of Indian art (Archer 1-15). The East India Company was formed to trade with East and Southeast Asia and India and was instituted by royal charter on Dec. 31, 1600. Although it started as a monopolistic trading company, it soon became involved in politics and acted as an instrument of British imperialism in India from the early eighteenth century to the mid-nineteenth century. The company was founded with the hope of dominating the East Indian spice trade. This trade had been a monopoly of Spain and Portugal until the defeat of the Spanish Armada in 1588 gave England the opportunity to appropriate the lucrative market. On the page opposite to The Indian Fruit Seller is a print, also by William Daniell, entitled Interior of a Mosque, Juanpore. These may have been placed intentionally against one another to contrast the sacred, interior space of the mosque with the less-defined, external space containing both the fruit seller and the banyan tree (banyan trees were often themselves considered sacred). Upon quitting Hurdwar, as I have stated in the conclusion of the former volume, we proceeded towards the mountains. A short distance from that venerated spot where ablutions in the Ganges are considered so especially efficacious to spiritual purgation, there is a remarkable banyan tree. It is consecrated to the worship of the Hindoo godhead, and its sanctuary is constantly visited by devout pilgrims from the neighbouring countries. The stem, of vast circumference, is surrounded by a terrace. It is hollowed out into a chamber of considerable dimensions, which has been converted into a temple by the pious zeal of the devotees who visit it daily, merely entering on one side and passing out the other, where they pay tribute, after the manner of all true believers, in the current mintage of the land; by which they acquire a mystical purification. Being aliens from the privileged stock, we were not allow to enter the adytum of this forest sanctuary, lest we should desecrate its hallowed mysteries and thus neutralize the potential efficacy with which the presiding diety is supposed to have endowed it. Even though the author, Rev. Hobart Cauter, is recalling a different tree than that which is depicted in The Indian Fruit Seller, William Daniell most likely associated his image with this account. Despite the title and supposed focus of the image, the featured "fruit seller" slumps away from us in the corner, giving the viewer a chance to contemplate the distant banyan tree surrounded by pilgrims. However, since the British travelers are of “privileged stock,” they exert their privileged gaze on a half-naked, female fruit seller rather than approaching the foreign, potential sanctity of the banyan tree. In this engraving, William Daniell draws on different elements of Indian mythology—accounts of holy banyan trees as well as images of yakshi, goddesses closely associated with the fertility of nature—to portray a woman fruit seller as occupying a potential site of sancitity. In the image of The Indian Fruit Seller, William Daniell captures the woman’s sacred and seductive qualities. The British contact with India shaped the ways in which women were incorporated into the picturesque aesthetic. The Daniells were undoubtedly familiar with the seductive images of yakshi on the façade of Karli: yakshi, portrayed as naked nymphs, were mother goddesses that could cause a tree to blossom with just one touch (Mitter). It is probable that Daniell is drawing upon this well-known myth by placing a naked woman, surrounded by ripe fruit, beside a banyan tree. As a result, this image enacts a type of transculturation by merging Indian artistic tradition with the picturesque to create a hybrid form. The Oriental Annual, or Scenes in India constituted a combination of fictional and instructional manuals that were widely distributed and read; many book reviews regarding The Oriental Annual are found in periodicals of the time. Archer, Mildred. Early Views of India: The Picturesque Journeys of Thomas and William Daniell, 1786-1794: The Complete Aquatints. New York: Thames and Hudson, 1980. Print. Daniell, William and Hobart Caunter. The Oriental Annual, or Scenes in India. Vol. 2. London, 1835. Print. 7 vols. 1834-40. De Almeida, Hermione and George H. Gilpin. Indian Renaissance: British Romantic Art and the Prospect of India. Aldershot: Ashgate, 2005. Print. Mitter, Partha. Indian Art. Oxford: Oxford UP, 2001. Print. Sutton, Thomas. The Daniells; Artists and Travellers. London: Bodley Head, 1954. Print. The Oriental Annual 1835. The Indian Fruit-Seller, Drawn by W. Daniell R.A., Engraved by R. Woodman, From Drawings by W. Daniell R.A., Printed by J. Yates.